PIERRE, S.D. -- A Rapid City man will be leading efforts that will benefit the South Dakota State Historical Society. Michael Lewis has been named the president of the South Dakota Historical Society Foundation, which is the nonprofit fundraising partner of the SDSHS. Both are headquartered at the Cultural Heritage Center in Pierre. “We’re excited about Michael’s leading the foundation and the opportunity to take the foundation to new levels,” said John Teupel of Spearfish, the foundation’s acting chairman. Lewis’ emphasis will be on fund raising and public relations for the foundation. Financial resources provided by the SDHSF have made possible suitcase education kits and traveling exhibits which are available to schools and communities statewide, and have enabled photographs and documents from the SDSHS-Archives to be available on the Internet. The foundation is also raising funds in order for the SDSHS Press to publish Laura Ingalls Wilder’s autobiography, as well as other projects. 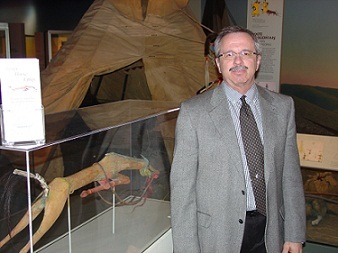 “Having been born and raised in South Dakota and having an interest in the state’s history, helping preserve the history of South Dakota is a natural connection,” Lewis said. Lewis, 57, brings a strong background in management to his new job. He has worked for Citibank (South Dakota) NA and was most recently an operations manager with US Bancorp in Fargo, N.D. He is retired from the South Dakota National Guard/US Army Reserve. Lewis has a bachelor’s degree in criminology from Florida State University, Tallahassee, Fla. He has master’s degrees in business administration from the University of South Dakota, Vermillion; and in strategic studies from the U.S. Army War College. He supports efforts of other volunteer organizations, such as the Boy Scouts of America and the United Way. The SDHSF is governed by a board of directors. Lewis will be based in Rapid City, with an office located in the Archaeological Research Center, a program of the SDSHS. “Even though I will be based in Rapid City, I will be supporting foundation efforts statewide,” Lewis said. Lewis’ wife, Barbara, is an attorney with Lynn Jackson Shultz and Lebrun in Rapid City. The couple has one son, Adam, who is also located in Rapid City.